When C.A. Ionides purchased this drawing it was thought to be a contemporary work by Honoré Daumier, one of his favourite French artists. However, it was later noticed that the flying letters in this drawing are inscribed 'Mola', referring to a seventeenth century Roman artist well-known for his witty caricatures. 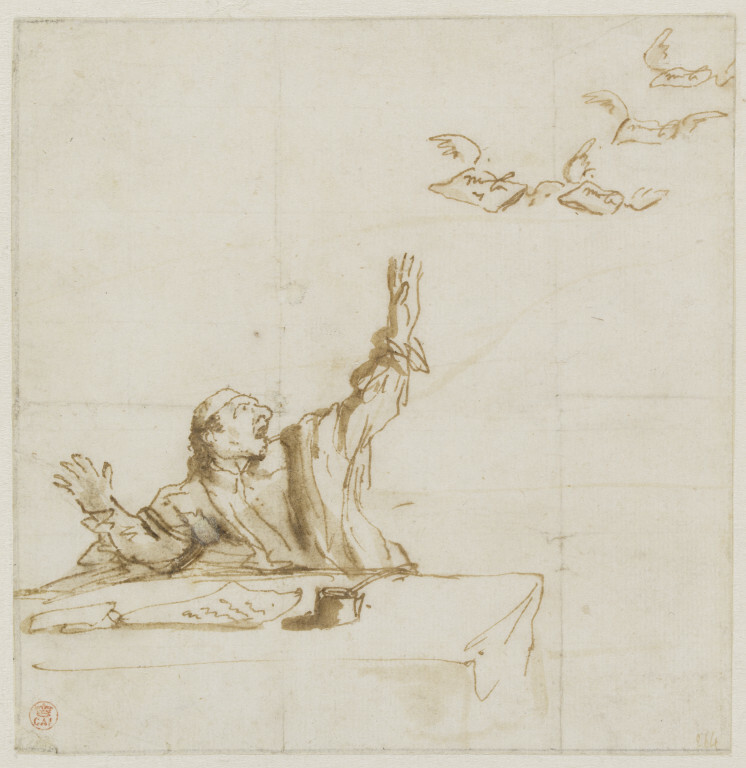 Here, a letter-writer reacts in alarm as his correspondence sprouts wings and flutters away like a flock of birds. Pen and ink drawing showing a man sitting behind a desk, throwing up both hands in startled response to winged letters which appear in the top right hand corner. Ward-Jackson, Peter, Italian Drawings, Volume Two: 17th-18th Century , London, 1979, p. 70, cat. n. 773, illus. The drawing was attributed to Daumier in the works cited. Mr James Byam Shaw first noticed that the flying letters appear to be inscribed 'Mola', and he proposed the present attribution, which is convincing on grounds of style. A similar caricature by Mola is in the Janos Scholz Collection, New York (Exhibition Catalogue, Italian Drawings from the collection of Janos Scholz, Arts Council, London, I968, no. 60; fig. I3b).